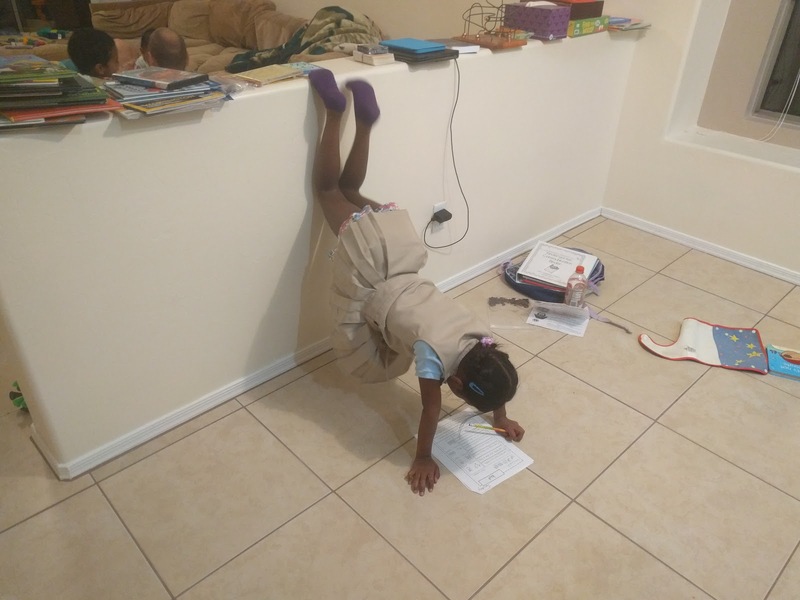 This is probably one of my favorite pictures since it captures so much of Sky: trying to do what's expected of her (homework) but in her own way. Sky has a very hard time sitting still for any length of time, as this picture, taken before our renovation, shows. I have no idea how she manages to get through a school day because the only time she actually sits when she's at home is when she's watching TV. This has been a little bit of a problem at dinner because she doesn't actually sit on chairs. She perches on them with her feet, sits on them with half her body off, lays on or across them, or stands next to them. Really anything but sitting. In theory, I don't have a problem with that but practically, we needed to address it for a couple reasons. One: our American culture expects you to be able to sit "properly" in a lot of social situations and an inability to do so will be judged against you (in job interviews, for example). 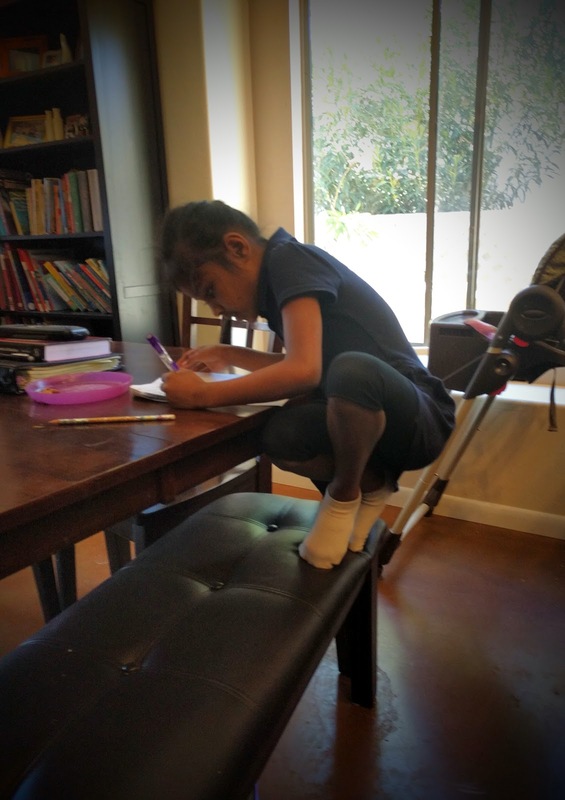 Two: her style of sitting is starting to rub off on her little brothers (see number one on why this is a problem). Three: holy cow, the mess she makes when she's eating because she's not contained in a single space at the table! I've been wanting to get a bench since we moved to help make the most of our small dining space and I thought that I might be able to kill two birds with one stone if I bought one- expand our seating at the table and help Sky learn to sit properly without having to constantly nag her about it. I took advantage of a sale recently and bought one. And there's Sky, still doing things her way. At least I have my bench and at least she's doing her home work, so I guess we both win and we'll keep working on this sitting business. Have you ever tried to solve a problem and your kids found a way around your solution? I wish I could be that limber! Wow! She is amazing! I first read your title as teaching Sky to 'spit' lol. Hahaha! Believe me, with three brothers, learning to spit isn't a problem in our house! Beautifully unique little girl. Keep lovin and tryin your best mama. Love this! Thanks, Sarah. The challenge so far has been to find ways to make it work for her, so we'll just keep trying. When we had our kitchen redone, I had bench seating built in an L shape,in part for the same reasons you mention. Nina now often stands on the bench, dances and bounces on the bench, and has also painted the bench with nail polish. Also, our larger dog likes to sit on it so she can join us for dinner! I still like it because it doubles as storage. Isn't it amazing how kids can find their way around our best ideas? We talked about making a built in seating area when we re-did the kitchen but since we won't live here forever, I didn't want to limit the space usage for the next owners. That being said, I would have loved to have the extra storage of a built-in.